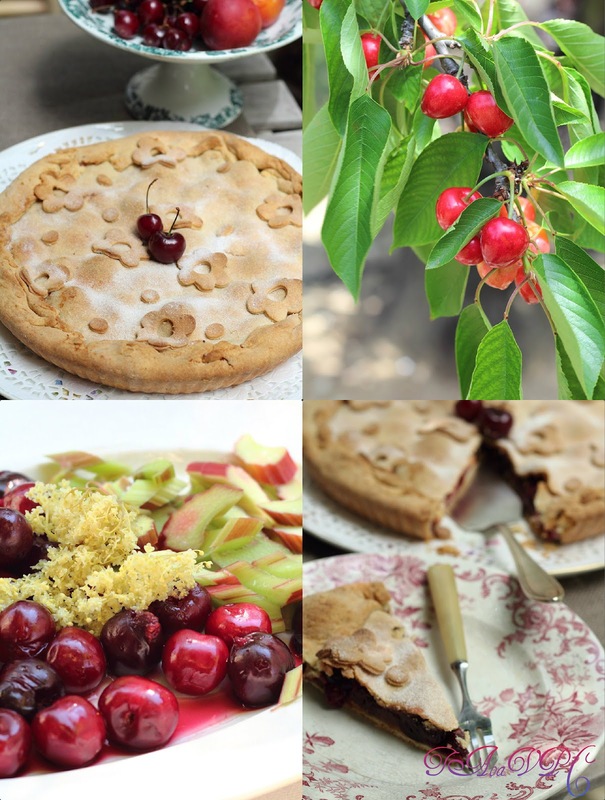 A very simple Rhubarb & Cherries ( yes I know , a little bit addicted like here ) . I made a classic crust but I substituted a small amount of wheat flour with some quinoa flour , I like its hearthy taste and it has given an unespected crunchy-smoothness to the crust . Sift the flours in a bowl , add the butter cut in small pieces and flatten with your fingertips till it comes like sand ( work quickly or the butter will ' burn' ) then add the sugar , the salt and the vanilla ,mix with a fork .Make a hole at the center , break the egg in , add a small quantity of water like half a eggshell and toss with the fork until it comes to a dough . If it's too dry sprinkle with some water , then make a ball , wrap it in a film and let cool in the fridge one hour or overnight . Wash the rhubarb and cut it into slices , wash the cherries and take off the stems and the kernel ,mix the rhubarb , the cherries and the sugar , put in a saucepan and cook till the rhubarb comes soft. Preheat the oven at 350 F or 180°. Stupende foto, per una torta golosissima. Una domanda, la farina di quinoa, la rende più croccante o cosa? Cara Stefania non saprei descrivere ....la pasta viene morbida e croccantina al tempo stesso ,deliziosa !Ma di quinoa ce né una piccola parte ,non si puo fare solo con quella . Comunque é gluten-free e ha un gusto originale e interessante . Baci !! buona, bella, sana... comincio a capire quando dici che con te non si ingrassa! Cara Giulia ,penso che avremo molto da condividere ! Anch'io ti ammiro .Baci! Davvero Giuseppina oggi e domani si celebra la Pie's day? Perché la coincidenza è che domani posterò proprio una classica apple pie....se è così sono molto felice. La tua mi fa impazzire, crosta leggera e innovativa...e poi quelle decorazioni così simpatiche! Io ti adoro, lo sai no? I love cherry pie and I bet the mix with rhubarb is fabulous. Love the dash of pepper too; I must try that. This is such a pretty pie! Happy Pie Day! fantastica, io ho provato rabarbaro e fragole e con le ciliegie dev'essere deliziosa!! !